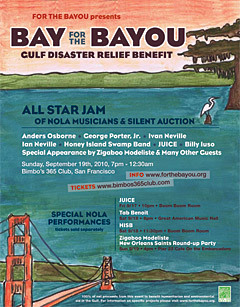 If your organization would like to become an organization or event sponsor, please contact us at info@forthebayou.org. There are numerous ways that your company or product can get involved to assist For the Bayou. For the Bayou is a 501(c)(3) non profit organization. Your donations are tax deductable. All officers, directors and members are voluntary & non paid. We are seeking corporate sponsors & individual donations. Please contact Jill Keagy, our CFO, with any questions regarding sponsorships and donations to our organization, 415.999.3283, or Elizabeth Welborn, Development Director, to learn about sponsorship benefits. All of our officers and members are voluntary. Funds raised will go directly to our wetlands projects and to humanitarian assistance needed in severely affected coastal communities of South Louisiana and the Gulf. Please learn about our Projects for more information on projects we support.